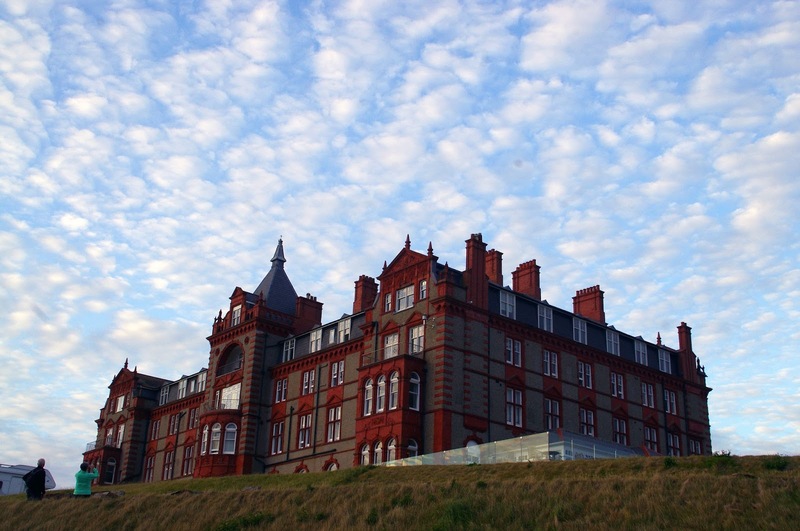 On our recent visit to Cornwall we stayed at the stunning Headland Hotel and dined at The Restaurant. 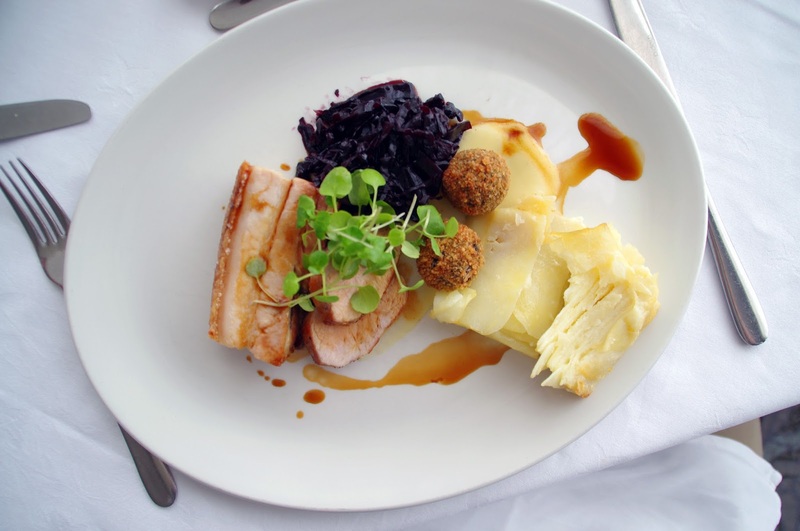 The Restaurant boasts breathtaking views over Fistral Beach and the Atlantic Ocean serves incredible, fresh, perfectly cooked food. We had a wonderful, relaxing evening enjoying fine food, wine and incredible views. 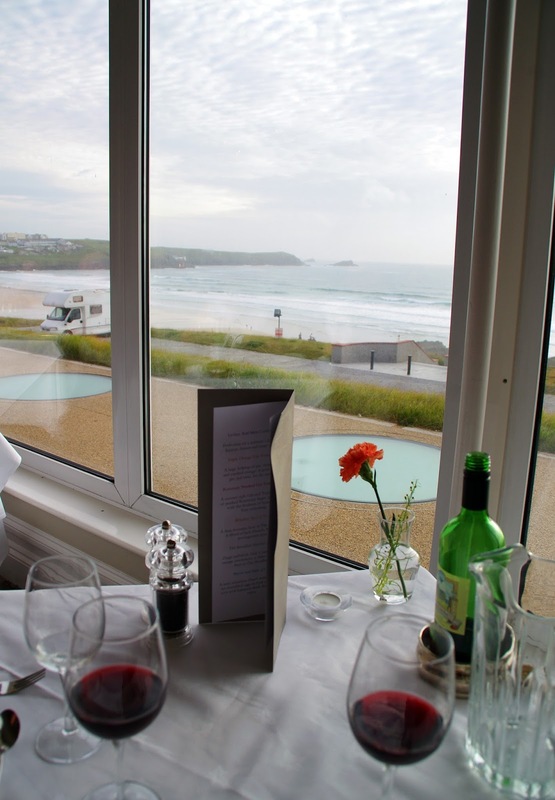 The Restaurant truly has in our opinion, the best views in Newquay. 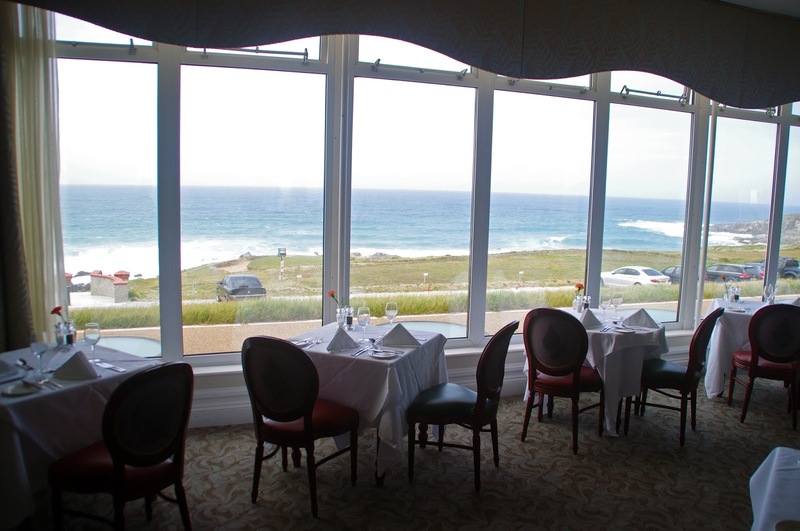 We were lucky enough to be seated at a window table, but no need to worry if you aren’t because the floor to ceiling windows boast the most incredible views and ensure that everyone in the restaurant can enjoy. In the late afternoon/early evening when sun is strong, sheer curtains are pulled across the windows which block out the blinding sun but still allow you to see the beautiful view! They really have thought of everything when designing this wonderful restaurant. 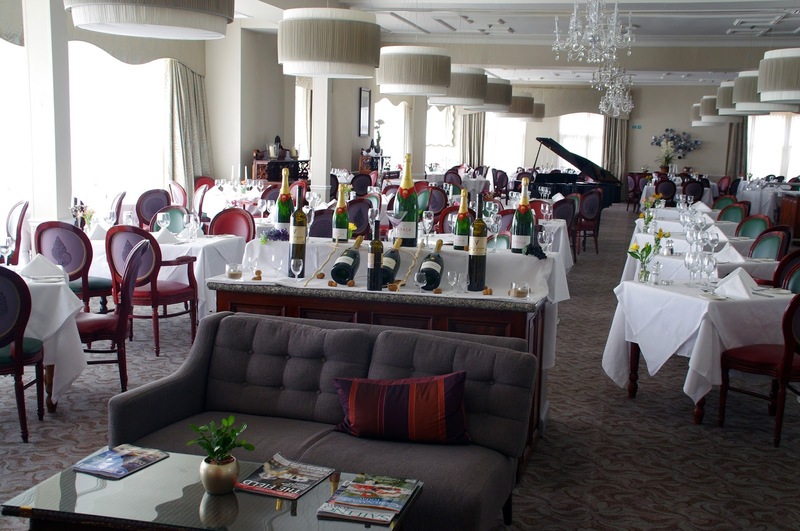 The Restaurant is elegant and beautifully styled. The sea front venue is spacious and seats a large number of people but by no means feels crowded. It has been styled and designed so that each party of diners has plenty of space and can relax and enjoy the stunning views. 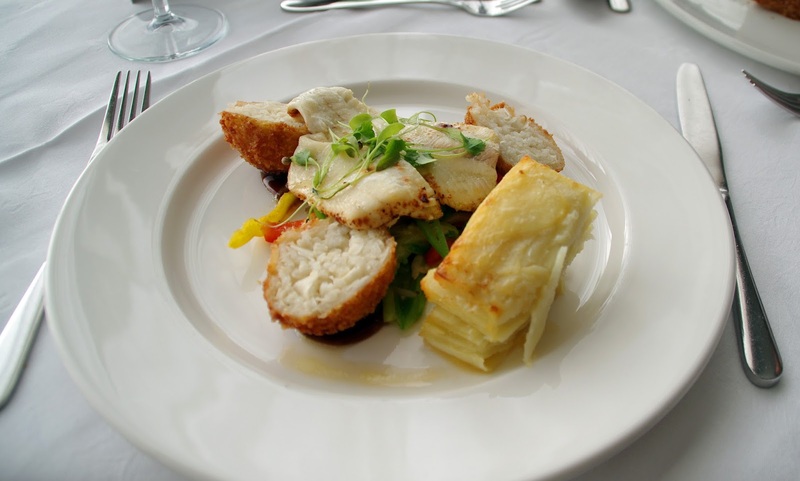 The dress code is casual and it is the perfect venue to dine in relaxed elegance. We were greeted by friendly wait staff the moment we arrived in The Restaurant and once seated we were brought ice water and a wine list to peruse. With a little help from our lovely waiter we opted for a bottle of the 2013 Stringy Bark Creek Shiraz Cabernet from South Eastern Australia. The wine was rich and full of flavour and we thoroughly enjoyed the flavour, generous palate and soft finish. 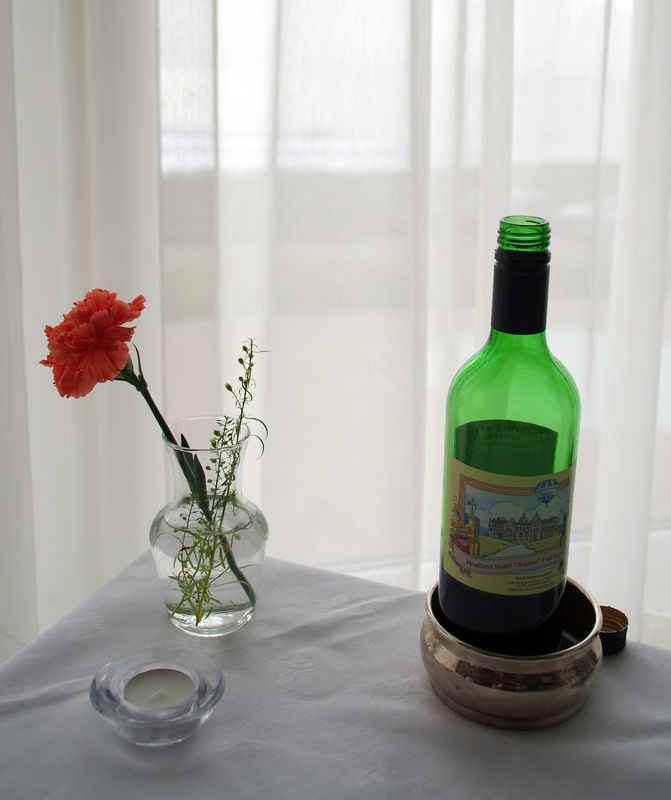 It was an excellent recommendation, we also appreciated the fact that The Restaurant are also happy to hold bottles over from one night to the next for their diners. 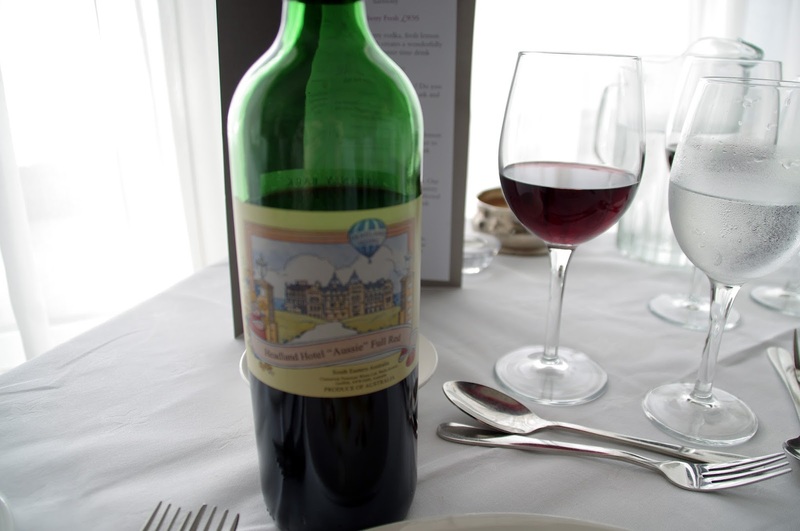 We loved the label on the bottle as well, which has been especially created for the Headland Hotel! 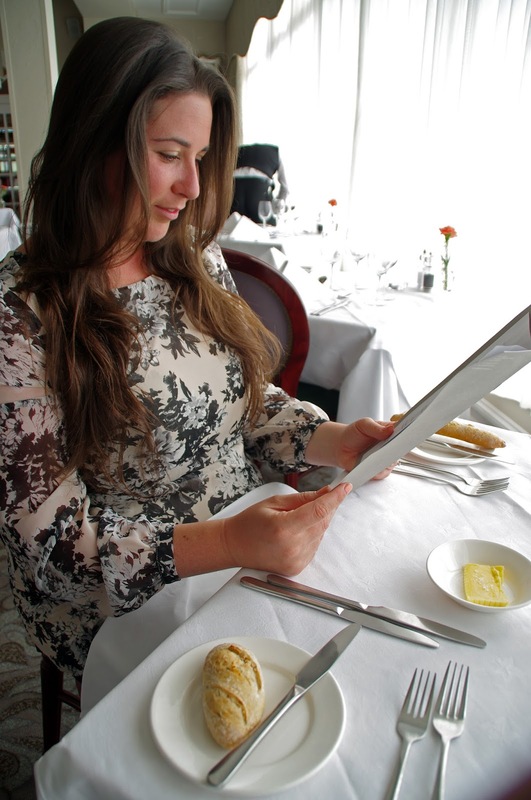 The menu is fresh, exciting and extremely difficult to choose from the mouthwatering range of dishes! 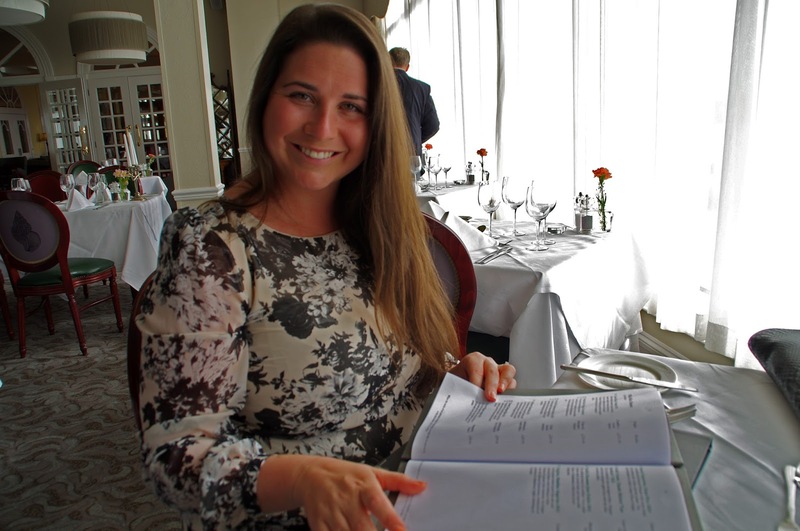 Each dish on the menu has been created using fresh and locally sourced produce and the staff did an excellent job answering all our questions and recommending dishes for us! Our waiters also brought us a selection of freshly baked bread rolls to begin with whilst we decided on our orders. 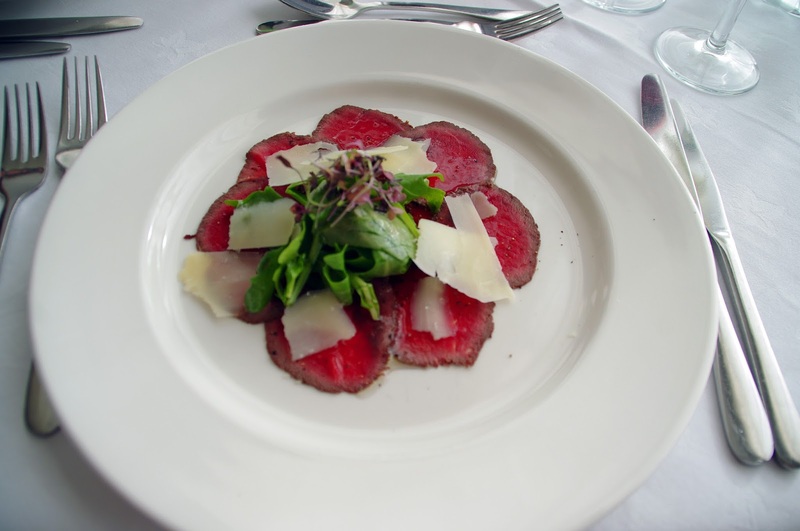 For his entrée, Dan chose the gluten free Cornish Venison Carpaccio which was served with rocket and parmesan and a balsamic dressing. Every element of this dish complemented each other and I almost had to beg him to try it! The freshness of each ingredient shone through and it was a perfect start to the night! I decided on the vegetarian option for my entrée which was a Caramelised Pear & Chicory Salad with Candied Walnuts and Cornish Blue Cheese. I loved this dish from the first bite. 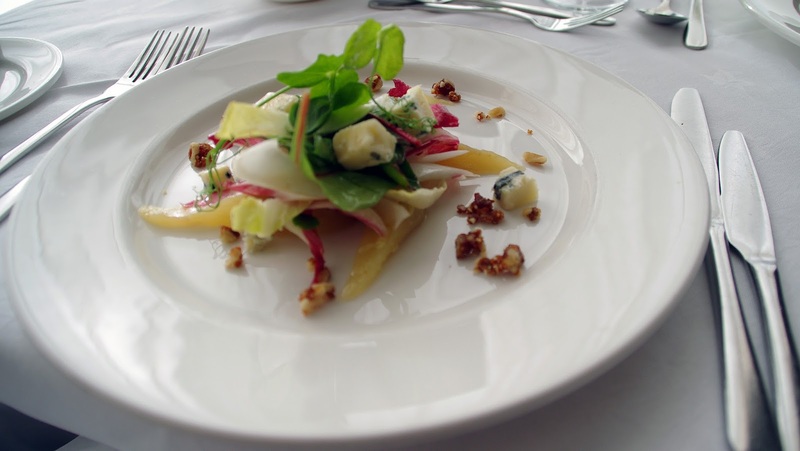 The ingredients were fresh and delicious with every ingredient working perfectly together from the sweet caramelised pear, to the strong flavour of the blue cheese and delicious flavours and texture of the candied walnuts. It was a fresh, unique and delicious combination of flavours! Both entrées were beautifully presented and thoroughly enjoyed. It was an excellent start to a evening of fine food and excellent views. 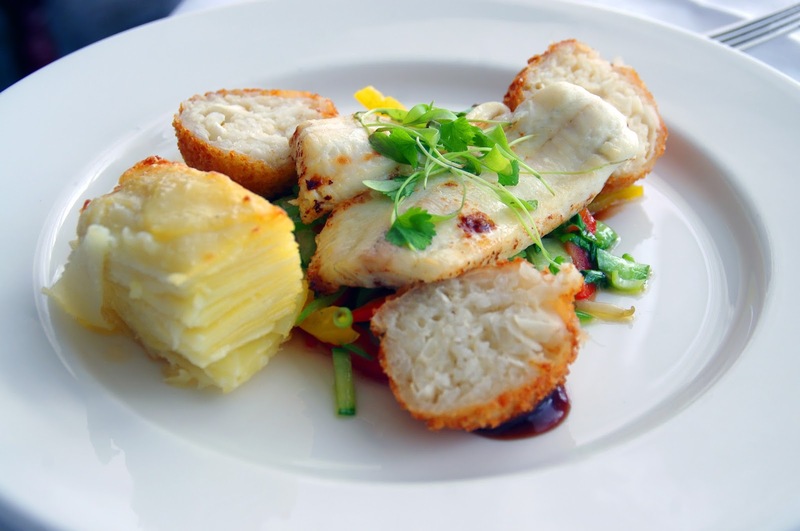 After an excellent start to the meal, I opted for the Market Fish served with Asian Vegetables, Coconut Arancini and Mango Pico and an additional side of Dauphinoise Potatoes (as I was extra hungry from a big day of surfing at Fistral Beach). The fish of the day was plaice and was fresh and flaked apart perfectly. The Asian Vegetables were crisp and the coconut arancini was the best arancini I have ever had! 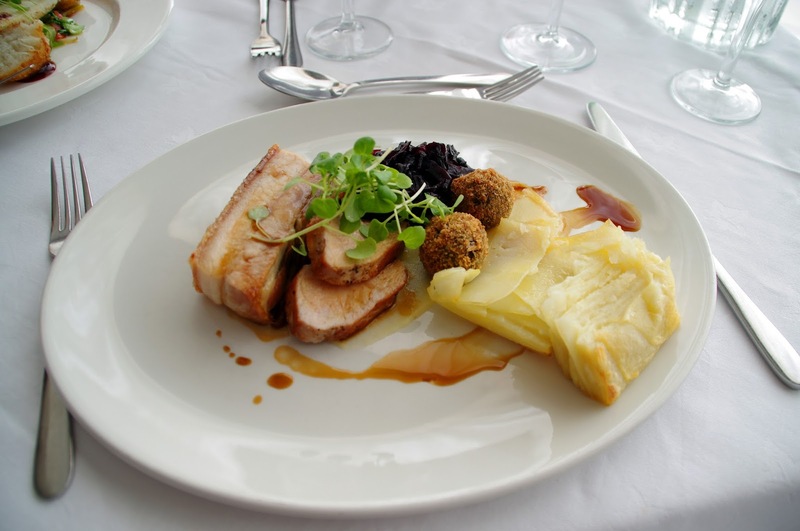 Every aspect of the dish was cooked perfectly and it was a excellent sized main course which I enjoyed every bite of. 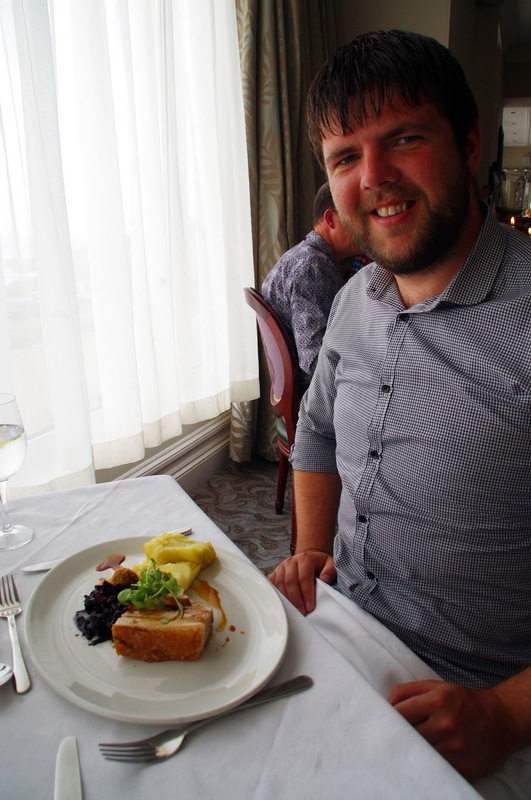 It was a big decision for Dan to choose between the Cornish Pork and Cornish Steak but after a lot of deliberation he chose the Loin of Cornish Pork with Crisp Belly, Braised Red Cabbage, Black Pudding Fritters and Apple Sauce. I also shared half my dauphinoise potatoes with him. I know that he was happy with his choice because I didn’t hear a word out of him until his plate was completely empty! 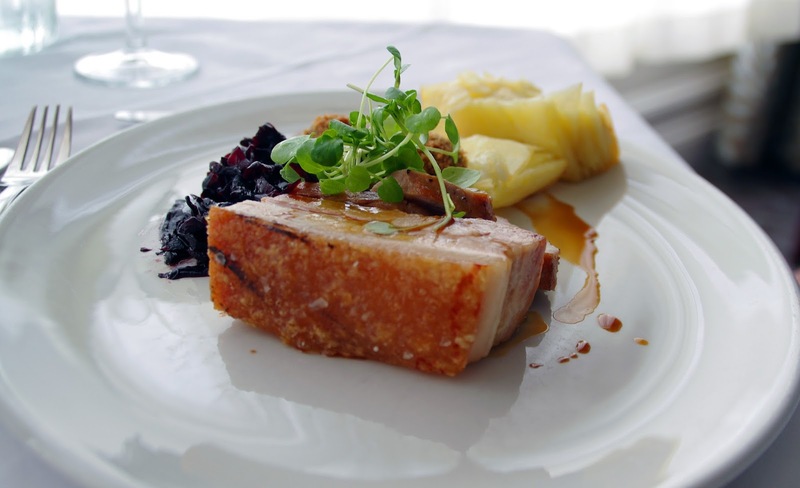 The pork was cooked to perfection with the crispiest of belly and complemented by the fresh, flavoursome braised red cabbage, delicious apple sauce and black pudding fritters. It was the most gourmet of roast dinners! 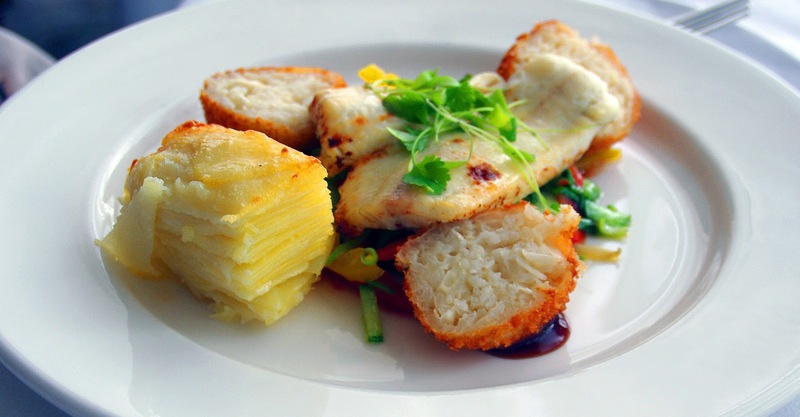 Similarly to our entrées, we were both very pleased with our main course choices which were cooked wonderfully, full of flavour and created using the freshest of produce and ingredients. The dessert menu was also mouthwateringly good and offered a wide range of incredible desserts to finish off an excellent evening. We decided to share the Chef’s Special which was a platter of six different desserts. We were blown away when this beautiful platter was presented to us! The beautifully presented dessert included chocolate fudge, chocolate cake, crème brulee, pannacotta, parfait and raspberry tart. It was evident the amount of work and detail that had gone into each mini dessert and they were absolutely divine. There literally could not have been a more perfect way to end an incredible night of good food, excellent service and breathtaking views. After we had devoured the dessert plate, we were very full, happy and continued to enjoy our wine whilst we watched the sun set over the Atlantic Ocean. We were very impressed with the service throughout of entire evening. Our wait staff were very friendly, attentive and helpful. 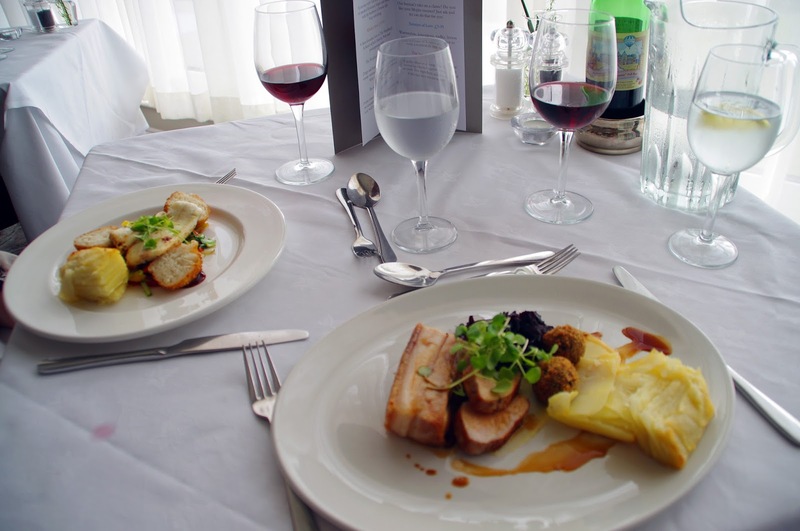 Our meals all came out in excellent time, with a little break between each course to relax, enjoy the view and our wine. 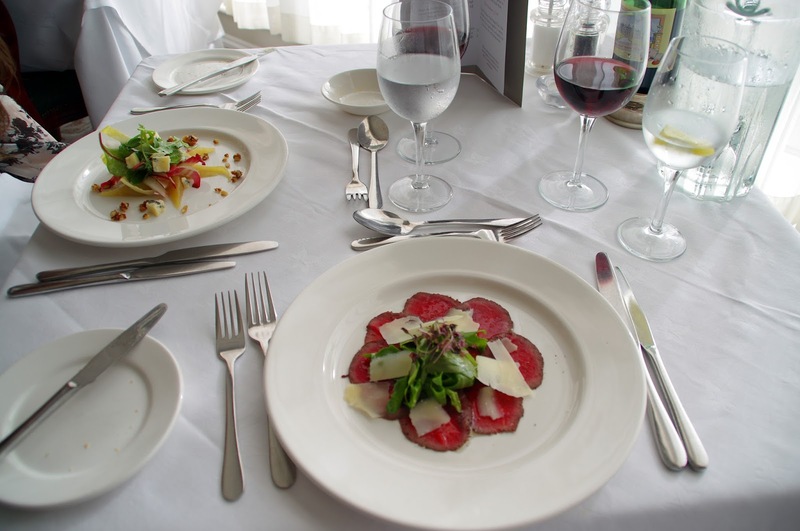 The food was absolutely fantastic, cooked to perfection, presented beautifully and used the freshest of produce and ingredients. 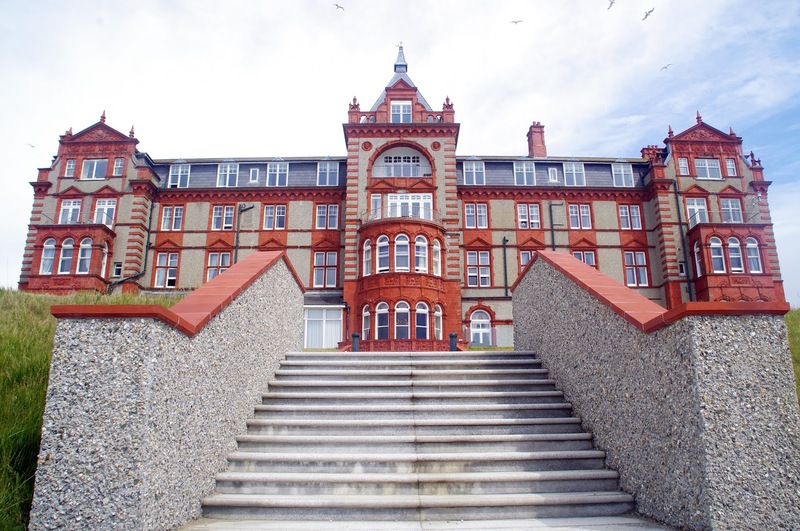 I highly recommend dining at The Restaurant at the Headland Hotel whether you are staying at the hotel or visiting Newquay. The combination of incredible food and breathtaking, uninterrupted views ensures the perfect dining experience. 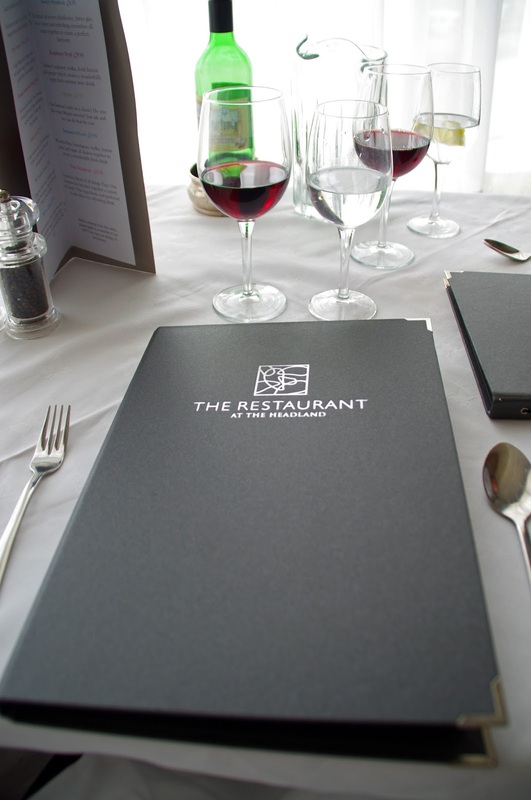 I also recommend you book a table as The Restaurant is very popular with guests and locals alike. The Aussie Flashpacker was invited to review The Restaurant.